For the fourth edition of Millesima Blog Awards 2017, Millésima has the honour to partner with Château Pichon Baron thus offering amazing prizes for the bloggers. The 7 winners will be awarded with an unbelievable trip to Bordeaux and will enjoy great moments in Axa Millésimes properties, including Château Pichon Baron. The domain has been created at the end of the 17th century, in 1689, when Pierre Desmezures de Rauzan purchased vineyards and created l’Enclos Rauzan. Those parcels will then be part of his daughter Thérèse’s heir when she married Baron Jacques Pichon de Longueville in 1694. The estate Pichon Longueville was thus created and remained property of the family for many decades and generations. In 1850, an inheritance divided the estate in two parts: one part of them remaining to Comtesse Marie Laure Virginie whereas her brother, Raoul de Pichon Longueville inherited from the other part who built in 1851 the majestic castle as it is today. 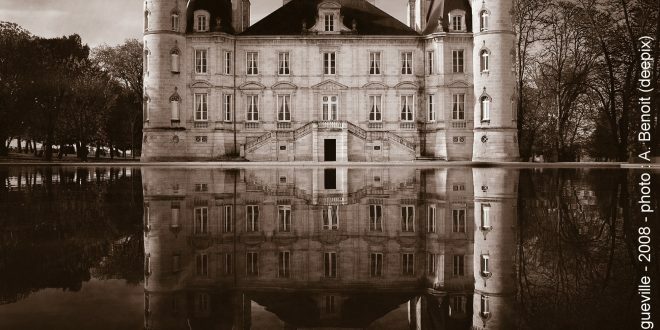 In 1933, the Pichon family sold the property to the Bouteiller family, who managed the Chateau Pichon Baron during more than fifty years. In 1987, the estate has been purchased by Axa Millésimes with a key objective: giving Chateau Pichon Baron a new glorious edge. The majestic property has ever since been glorified with a water mirror and a superb cellar with wooden barrels, built in 2008. Chateau Pichon Baron spreads over 73 hectares of a very good quality gravelly soil. This exceptional land is low in nutriments without any water excess and feeds thoughtfully the 35 year old vines. 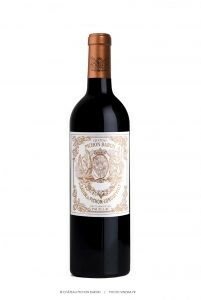 Wine from Château Pichon Baron results from an exclusive selection of the oldest vines producing a limited quantity of rare quality fine wine. The estate Pichon Baron is planted with 65% of Cabernet Sauvignon, 30% of Merlot, 3% of Cabernet Franc and 2% of Petit Verdot. Each parcel benefits from a specific labour adapted to its profile. The great terroir of “Pichon Baron’s hill” (an historical part of the estate that was already planted at the creation of the cru in 1694) is only devoted to the production of the Great wine. The Château also produces two other wines made from vines planted on the other parcels : Les Tourelles de Longueville and more recently : Les Griffons de Pichon Baron. The great wine of the estate is a second growth (from 1855 classification) and comes directly from the oldest vines and historical terroirs of the domain. As an authentic Pauillac, it offers a sensorial experience, intense nose with a great complexity of fruits. In mouth, this wine releases elegance, with powerful silky tannins, with a long lasting palate, persistent and fleshy. Chateau Pichon Baron benefits from an exceptional aging potential and can be enjoyed after more than 40 years for the best vintages. The name of this second wine comes from the emblematic towers of Château Longueville, picturing the whole beauty of the place. Les Tourelles de Longueville is made of vines from the Sainte Anne parcel mostly planted in Merlot. This dominance of Merlot gives this wine a great personality and roundness making it enjoyable to drink young. Les Tourelles is a charming and voluptuous wine that will offer you a great tasting experience. It can be enjoyed young but also benefits from a great aging potential up to 15 years. Last but not least, this wine has a great personnality, pure and straight. This wine is essentially made of Cabernet Sauvignon grapes coming from gravelly parcels near the Gironde estuary. 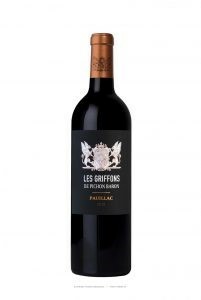 Griffon de Pichon offers an energetic amplitude and straightness. Fresh and tonic, this wine can be enjoyed young and will develop more complex flavours after up to 20 years of aging. Previous: Millesima Blog Awards 2017 – Applications are now open!